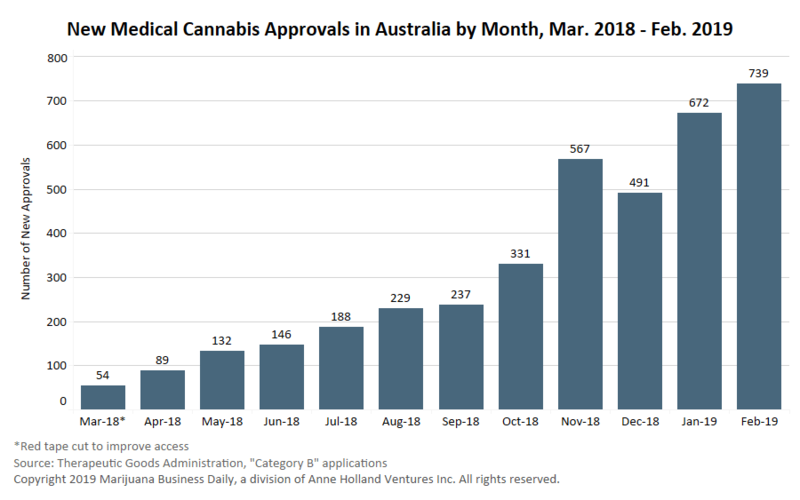 Australia’s medical cannabis market could surpass 15,000 patient application approvals by the end of this year, with industry revenues totaling roughly 36 million Australian dollars ($25 million), according to an analyst’s forecast. While both totals may seem low by North American standards, they represent “a decent start” for the country’s emerging medical cannabis industry, said Matthijs Smith, senior analyst at Canaccord Genuity Group in Australia. If monthly approvals continue to match the February pace, a total of 11,600 patient approvals will have been granted by the end of 2019. “We are expecting growth in these numbers, so it is quite possible that 15,000-plus applications may have been approved by the end of the year,” he said. Smith said barriers to accessing cannabis for medical purposes are higher in Australia compared to markets such as Canada. “We are still trying to get a feel for how big and accessible is the relevant patient pool,” Smith said. A year ago, federal and state governments sought to cut red tape to improve access to medical cannabis by introducing a single application process on the Therapeutic Goods Administration’s website. Though significant barriers remain, early data shows access has seen some improvement. Before the changes, only 73 requests to treat patients with medical cannabis were approved. Since the red tape was cut in March 2018, roughly 3,800 applications have been granted. Monthly approvals have grown steadily. Fifty-four applications were approved in March 2018, while 739 were approved in February 2019. “There has been a concerted effort to improve and streamline the process, which has resulted in a significant uptick in patients over the last six-eight months,” Smith said.